SOUTHWELL. Of the history of the town of Southwell there is a little to relate. It was a gay place at the beginning of the last century, delighting in its archery meetings, bachelors’ club, theatre (built in 1816), and a billiard room. The interest of the place is centred in the Minster, which was founded by Paulinus, the first Archbishop of York, in A.D. 627. Southwell was made a cathedral city in 1884, and yet has remained a village with less than 3,000 inhabitants. Privileges have been granted from time to time by kings, archbishops and the Chapter of York. Charles Stuart rode a free man out of its streets, and here, at the Saracen’s Head he stayed before giving himself up to the long captivity that brought him at last to the scaffold. Here Wolsey came, never to rise again to power, and Byron spent his holidays at Burgage Manor. At Easthorpe an apple tree was grown from pips planted in Trafalgar year, and when Mr. Bramley carne to reside there, the tree flourished. So, possibly, came the famous Bramley Seedling. In 1805 the Chapter accepted the gift of the brass lectern, now in the choir, which had belonged to Newstead Abbey, and had lain for more than 200 years at the bottom of the lake at Newstead, hidden there by the monks at the dissolution of the monasteries. 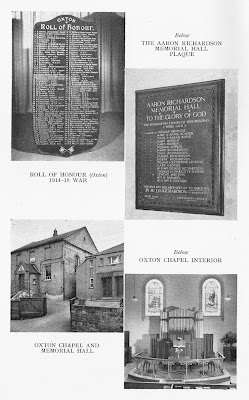 The Pentecostal Offerings on Whit-Sundays were con­tributed from every place in the county of Nottingham­shire. The fabric of Southwell Cathedral was saved by Edward Cludd, who was buried at Southwell in 1678. A royal edict had ordered the body or antechoir of the Church at Southwell to be taken down, but this moderate man opposed the government of the King and obtained a revocation of the warrant for its demolition. He was a Justice of the Peace and Knight of the Shire for the County of Nottingham in the Barebones Parliament, and by virtue of his office, married many folk under a venerable oak in Norwood Park, his residence. The Justices’ weddings ceased, but the oak remains as Cludd’s Oak. The town was the scene of persecutions. It is recorded that Thomas Ingall, for having a peaceable meeting in his house, was fined £20. He was sent to prison by Cecil Cooper, a Justice. On another occasion his goods were confiscated to the value of £31, and subsequently they took away his corn, hay, carts and cattle, to the value of £97. It is little wonder that men so outraged should have set out as Pilgrim Fathers from this county, to establish freedom across the seas, in America. Methodism was introduced at Southwell a century and a half ago, and began with the conversion of an Epperstone man named William Neape. He was a sportsman and a loyalist, and was opposed to the Methodist teaching.. He turned a bull into the midst of an outdoor congregation, but all that happened was that a woman was thrown down and not hurt, as the animal leapt over a wall. Mr. Neape appeared in his regimental uniform to prevent sermons in a neigh­bouring village, but was himself moved by the preach­ing; and his prejudice against the class meetings, which he called the ‘dark meetings’, was removed when he attended one. After his conversion he made plans for a public preaching at Epperstone. The change in him awakened much attention. Old companions staked bottles of wine that his religion would not last a month, but the bets were lost. He came on to the plan in 1800, and preached his first sermon at Farnsfield. His former friends came to the service and were amazed by what they heard. His testimony was of the blessings of God in all things. His concern was Southwell, where the local opposition to the Methodist Church was great. A barn became the place of worship, and the pulpit was a barrel. In 1810 a site was procured, when a tradesman, having speculated beyond his means stated his case to Mr. Neape, offered a plot, and allowed the land to be taken by the purchasers despite a higher bid for the site. So the Methodists got a foothold, and remained in that place for thirty years, though opposi­tion continued rife and the business of a tanner was established on part of the property. Miss Neape, venerable in years, still tells of how the Vicar-General of the Chapter, who was chairman of the local bench, tried to stop her collecting for Overseas Missions, but despite his prejudice she went on with the good work. In 1835 a new chapel was required, and Mr. Neape’s son was miraculously restored to health in order to accomplish this purpose. The opposition was com­plicated by Chancery Suits, but another piece of land was obtained in a central situation, so the present chapel was erected in 1840, and opened by Doctors Jabez Bunting and Robert Newton, assisted by the Rev. S. D. Waddy. A renovation was later undertaken, and a new organ introduced, the building being re­opened by the Revs. William Arthur and Charles Haydon. The Peacocks were true Southwell heroes. There was the father, who was a local preacher, then there is Charlotte, the eldest daughter, who keeps house for her sisters besides doing a great deal of welfare work at Greet House; there is Ethel, who won the M.B.E. in a London blitz; and F. J. Peacock, who owns a nursing home in Southport; while the brother, C. E. Peacock is a missionary in Newfoundland. These in addition to the brother who passed away in Darlington in 1939, form a family of which Southwell may well be proud. In a village near by, Mrs. Dorothy Clark died in 179o, aged 112 years. She enjoyed good health, and when over 100 years old, reaped wheat a whole day against a man, and performed the work with great ease to herself. The circuit of Southwell was created from the Mansfield Circuit, at the first Nottingham Conference in 1876, and with it were associated Farnsfield, Oxton, Calverton, Woodborough, Epperstone, Lowdham, Edingley, Halam, Winkbourne, Kirklington and Bils­thorpe. Thurgarton was added later. The first Quarterly Meeting of the new circuit was held on 25th September in the same year, when Mrs. W. J. Norwood and Mr. W. Cook were elected stewards, and Mr. W. Baguley was appointed secretary. The income was nearly £45, but the expenditure was almost £49, leaving a deficit of £4. The membership was 282. The new hymnbook of those days was recommended. This is in strange contrast with the earliest Quarterly Meeting of the original circuit, in 1810, which showed an income of £23 and an expenditure of £23, which included quarterage for two ministers at £4 4s. each, as well as turnpikes, letters, paper, horse, rent, coal, candles and horse’s fodder—quite good book-keeping! The modern total is for one minister’s quarterage and the circuit expenses, and amounts to £195. 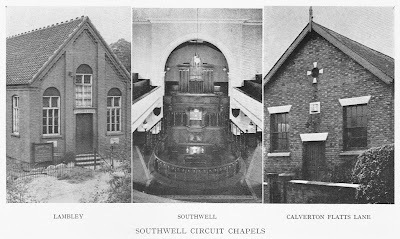 The work of the Southwell Methodist Church and Circuit is greatly helped by the Misses D. M. and A. M. Dowse. Miss D. M. Dowse is a Justice of the Peace and District Treasurer for Women’s Work. She served as Circuit Steward and in this office has been followed by her sister who previously acted as Circuit Secretary. Miss F. M. Bond now holds this office. Mr. F. Bond served the cause well, for he was steward several times before his lamented death in 1954, and his son, Eric, follows in his father’s footsteps. The Baptists were busy from 1811, and in 1839 a permanent building, previously the workhouse, was opened by them. The succession of pastors includes the names of J. H. Plumbridge, J. T. Frost, E. B. Shepherd, F. Norwood and J. E. Lancelot-Morgan. In 1933 a legacy of £500 was bequeathed by Mr. John William Wand, which enabled the deacons to instal electric light, new heating and to redecorate the building. Woodborough. Two miles south of Oxton is Wood­borough, once a busy centre of the stocking knitters. The remarkable church, dedicated to St. Swithin, once had chancel windows rich with painted glass, but later they fell into disrepair. The present chancel, with its fine east window and graceful tracery, was built by de Strelley in the fourteenth century. The fashioning of the reading-desks, the screen across the lower arch, and the pulpit, were done by Mansfield Parkyns as a memorial to his wife, and became his own memorial also, for he died in 1894. So much for the place of worship and its donors, but what of the village, which used to consist of 100 dwellings? The year 1798 was of considerable import­ance to Woodborough, for on the enclosure of an open field at Calverton, the nether close there was awarded to the poor of Woodborough parish. But, like so many other charities, it was lost as time went on. A consider­able part of the field was allotted to the prebendaries of Oxton and Woodborough, the income from it being divided among the poor, and used for the teaching of ten boys and girls to sing psalms. Notable folk have lived in the village. Elizabeth Bainbridge, a lady-bountiful to the community, lived at the old Hall until 1798, and about the time of Queen Elizabeth I, the Jebbs, eminent literary folk, made this place their home before they settled in Mansfield. Here, too, is the last resting-place of George Brown, a Baptist minister who knew his Bible so well that he won fame as a walking concordance. Living today is William Chamberlain whose devotion to the Baptist Church in Woodborough is remarkable. He has held all its offices at various times, and under the Rev. Samuel Ward of Nottingham, began the work by preaching in the open street. William Clay became the first deacon, and remained in office until his death on 3rd November, 1849. His remains were interred in the chapel and a tablet was erected to his memory. It is rather unique to have had a burial inside a village chapel! `As a rule they were not hostile crowds the Methodists addressed, at least not in the manufacturing districts. It was another matter when their advent woke up some sleepy conservative town or cathedral city, or when they delivered their message to the dependants and hangers-on of some great landed proprietor. There they might count on a rough reception. It was at Grantham that John Wedgwood was pulled down whilst preaching at the market cross, and led off to prison. It was at Newark Mr. Lock­wood was played upon by the town fire-engine, as though he had been a conflagration, until half-drowned, he could but gurgle `You can’t quench the fire within’. It was at ducal Bottesford the church bells and a brass band were both requisitioned to drown the preacher’s voice, and it was at Shelford, another aristocratic preserve, where two cottages were pulled down in succession, because their occupants had opened them for preaching. 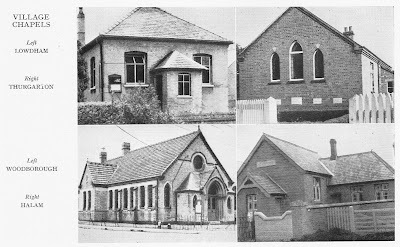 Primitive Methodist services in Woodborough were subsequently held in the house of. William Bradley, until a barn was secured, where light was by candles mounted on a wooden wheel, where seats were rough planks, and a layer of straw did duty as a carpet. It was here that Joseph Marriott, a frame smith’s appren­tice, was converted. He became a local preacher and remained one for more than sixty years, as well as being a devoted worker and wise leader in the society to the end of his long life, triumphing over many physical infirmities. The prosperity of the society continued, and in the autumn of 1851 a chapel, on the site of the present one, was ripened. It was twenty-four feet square, and the cost was £1,220 10s. The opening services were conducted by the Rev. John Petty, of London. The Sunday school was held there, and it did duty in some measure as a day school also. Boys and girls wrote their `pothooks’ and learned their alphabet, and it was the only education which some of those who afterwards became stalwarts in the cause, ever received. During the next few years there joined the chapel a remarkable trio of men whose influence, together with that of Joseph Marriott, moulded the society’s life and affairs. They were James Leafe, who started the hymns with a tuning fork, and afterwards became the organist for thirty-six years, James May and William Orange, who served to the end of their days as Sunday school teachers, stewards and class leaders. In 1871 the chapel was enlarged, and an organ was installed, while a school was opened in 1900 at a cost of £353. Twenty-six years later, a thorough renovation took place, when a central heating system was added, and in 1932 electric light. The Church rejoices in the work of Councillor A. E. Foster and his wife, even as it gives God thanks for the labours of James May as treasurer of the Trust. He was succeeded in the office by J. Alvey, who is still with the society. The name of James Bradley goes back in the school records for over seventy years. Mr. A. E. Foster pays warm tribute to the ladies who have supported the work through the years. By the way—it was he who, in 1952 spoke in the Bertram Mills Circus tent, to young people. The beginning of Wesleyan Methodism in this village was early in the last century, and preaching began in a house at the top of the village which is the present post office. In 1812 the house occupied by Miss Lee as licensed for preaching, and that document is (still retained. There were only three members at first, and a small Sunday school was opened in a shop on the site of the present Co-operative Stores. In 1827 the increase of members justified the erection of the old Wesleyan Chapel in Roe Lane, and in 1876 the membership was twenty. In 1887 the new chapel was built at a cost of £665. In latter days the work of County Councillor Frank A. Small, of the Homestead, Woodborough, has been praiseworthy. He is an excellent local preacher and society steward at Woodborough, and has been the Circuit Steward of the Southwell Circuit. He is the chairman of the Finance Committee for Nottingham County Council, and his wife was responsible for the present Sunday school in the village chapel. They both attended the Queen’s garden party at Buckingham Palace, in 1955. Miss R. Crampton, of Averham Cottage, Wood­borough, writes as a Methodist of the third generation, and remembers the services being held in a thatched cottage, and the opposition aroused by the conversion of the building into a chapel. She speaks of the work of the brothers Clayton and of the stately bearing of the late Mr. Thomas Shipside, who was courteous to every preacher that came. Mr. A. Robinson tells of the work of William Robinson, and remembers, when he was a Sunday school scholar, over seventy years ago, some­one came from Nottingham to talk of Robert Raikes. It was here at Woodborough that, in 1953, the Grandfathers’ Band was brought together again for the celebrations in connection with the Coronation of the Queen. And what a band they were! Frank Richard­son, the. village butcher’s roundsman, conducted, and played at the same time, and the bass was played by the village cobbler, while old Ben Wright performed on the trombone and his son played the cornet. They are both market gardeners. The Ward family was represented by the father and two sons. The father is a petroleum worker, and plays the cornet, while Harry, his son, is an electrician at Calverton Colliery, and Tom, his other son, plays the kettledrum in his spare time from market gardening. Seventy-year-old John Richardson, a jobbing gardener, plays bass. The contentment which showed in their faces as they played the musical salute to our young Queen, augurs well for their continuing in service and sacrifice for the good of this village and its folk. Thurgarton with Horspole. This area was valued origin­ally at L3, and the Hall is known as the Priory, where the first Bishop of Southwell lived. Here Sir William Babington (1356-1455), the King’s Attorney, retired to become a Privy Councillor, till he died at the age of ninety-nine years. He founded the Chantry at St. Peters Church, Thurgarton. The Wesleyan Methodists were late in establishing themselves in the village. Previous to 1833 services were held in a cottage on Chequers Farm, but in that year a wooden building was erected on a piece of rented ground. In 1922 the old wooden building was to be moved to another site, which had been sold to the chapel authorities by Trinity College, Cambridge, but a gift of £50 and a grant from the Connexional Chapel Committee decided the folk to build a new structure, of ‘which the foundation stone was laid in 1927, the builder being Mr. John Lewin of Netherfield. The land cost eighteen pence per yard, but the estimated total of £27, when the posts were erected to mark out the place, reached a sum of £40. Stones were laid in memory of the Local Preachers, Ladies’ Guild, Henry Brett, Josiah Bird, E.A.M., of Fiskerton, and the Trustees. It was a chapel with a school and the usual out-offices. The communion table was presented by the family of the late Mr. and Mrs. John Kind, the two communion chairs by Mrs. Makins and Mrs. Green in memory of Mrs. Holmes and her daughter. The pulpit Bible and hymnbook were the gifts of Mr. and Mrs. Crampton. The total cost was £1,134, of which £994 was obtained by the opening day. The building was dedicated by the Conference Secretary, the Rev. Thomas Kirkup, and the local superintendent minister, the Rev. J. H. Cundy. The success of the effort was largely duc to the work of Mr. J. J. Williams. Of the old wooden building we are told of carol services arranged by the members to raise money, of a clock given by Mr. H. H. Kind, of thickly buttered seed cake and balm loaves at the anniversaries, of a horse caught by Mrs. Rhodes and sold for the building fund for £1. Mrs. Scrivener, who was a maid-servant for sixty years, tells of Squire Milward, whose hatred of the Methodists went to the point of scattering them with a horse whip and buying before the public auction the little old house they desired to have. Mrs. Richard­son, who preached during the shortage of local preachers, and was the first lady Circuit Steward of the Southwell circuit, played the organ for fifteen years, but resigned the post in 195o so that her niece Miss Marriott could take over. Mrs. Richardson is now well over ninety years of age. Her class, first at her own house and then in the Temperance Hall, was productive of much good among the members of this chapel. Lambley. Lambley lies in the hollow of the hills six miles south of Oxton. It was a place where the stocking frame rattled all day long. Here, in 1394, was born Ralph, Lord Cromwell, who, when Chancellor of the Exchequer, is said to have prepared the first of our budgets. He built a manor house at South Wingfield in Derbyshire, which is now a ruin, and was buried at Tattershall Castle in Lincolnshire. His badge of office -a purse- is carved on stone panels by the east window of Lambley church, a small sanctuary with a low tower and one bell, which is dedicated to the Holy Trinity. Mr. J. and Miss Sears. As the fine village hall was not paying its way, the villagers sold their ten shilling shares in it for whatever they could get. Then followed a meeting under the principal shareholders, Mr. and Mrs. Wilkinson of `The Firs’. The event was much talked of in the village and the Wesleyan Society decided to purchase the hall if they could get the permission in the first place of the circuit officials. The superintendent minister was the Rev. John Freeman, and, with the help of Mr. J. D. Marsden and other circuit officers, he bought the premises for £700. It is now free of debt, the purchase being completed in 1922. The opening service and dedication took place on the 2nd November of that year, the ceremony being con­ducted by the Rev. John Freeman, with Sir Arthur Black as chairman of the gathering. Meanwhile, the old Wesleyan church was sold for £100, bought by Mr. F. Kirkby for a dwelling-house, and the sum accruing, together with a grant from the Chapel Committee, was of considerable help in the new venture. The progress of the cause has not been spec­tacular, but it has saved many young people from the evils of the time. The folk who were responsible for the venture of the Wesleyan church have, of course, passed on, but the work continues, and recently nine scholars have signified their intention of becoming members. There will be a spiritual revival and prosperity in the days to come. 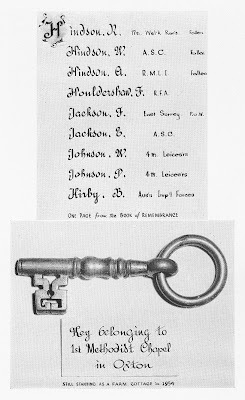 Among the old members was Henry Dickman, who passed over in August, 1953. He used to set out from the village each morning to walk the eight miles into Nottingham and he at work at six o’clock. He was regular at the services, and faithful for over sixty-five years as a society steward. He kept pigeons, but his life work was first that of a framework knitter and then a dyer. He left school at twelve years of age and started work on a farm for sixpence a day. His wife worked as many as twelve hours a day doing washing for the neighbours for the sum of eighteen pence. Of such is the hope and backbone of Lambley and the world. Gonalston. Gonalston is famous for its spittle, founded by Heriz. Its church has a gallery of heads and three ancient tombs in which two of the knights memorialized have their legs crossed. The village is sheltered by low hills in a pleasant countryside, where the Dover Beck flows into the Trent. Its main claim to fame or notoriety is the old water mill, the setting of the story of Blincoc, aged seven years, who was sent from St. Pancras Workhouse in London in 1799. He and some others were apprenticed to the owner of the mill until they were of age, and were told, so it is said, that they would be fed on roast beef and plum pudding. Instead, these children worked fourteen or more hours per day and were poorly fed. Blincoe was made a winder, but, not being tall enough to reach his work, was beaten by the overlooker. He made an effort to escape and on his recapture was thrashed. The children lost joints of their fingers in the mill, sometimes, and this lad had the forefinger of his left hand crushed; but a surgeon repaired the damage, and he was put to work again before his removal to Sutton Mill near Tideswell. The boy survived the ordeal, though crippled and deformed. He became a journeyman, and then a chapman, and finally kept a small grocer’s shop. Charles Dickens’ story of Oliver Twist did much to end such abuse of orphans. Halam. Standing in a valley, five miles from Southwell, is the village of Halam, whose church tower still keeps the pyramidal roof despite modern restoration. When the new aisle was made to that building, a row of pillars was discovered. The village school, a barn standing in School Lane, had as mistress Miss Butler, who was ruthless in her discipline. She introduced for the excessive talkers `tongue bags’, which, made of linen, were fastened round the ears, and contained flour. There was no playground, and as a result, no organized games. Instruction was limited to the three R’s, and the scholars, who numbered between twenty-five and thirty, paid twopence or threepence a week for the privilege of being taught. There were two shops in the village, one of which is now a private house. That kept by Mr. W. P. Richardson is still functioning, but is not now the post office. The Manor House with its whale bones forming the entrance, still stands. There was a water mill as well as a windmill in Home Lane. The tradespeople included a huckster, a shoemaker, who made boots for the county and had several apprentices, a joiner, a blacksmith, a tailor who lived in a poor house, and farmers who left money to be distributed. The village boasted a pinfold and a stocks near to the poor houses of Mary Lamb. There were three of these poor houses, which were of the one room up and one room down type, the upper room being reached by a ladder. The Feast was celebrated in October, and there was a May Fair for two days and a Plough Monday celebration. Features of these festivities were Betty Gilbert’s butterscotch, a magic lantern, and occasion­ally a dancing bear. A famous nursery for larch and spruce was maintained here, and Samuel Bradley raised the Paxton strawberry; and still the tradition goes on. In the olden days it was a place of longevity, for in 1775 two folk died at the age of ninety-two years. The meeting house of Nonconfirmity was the build­ing in Church Street now used as a school canteen. Persecution abounded here in the seventeenth century, for there are records of Mary Dring being fined £10 twice for holding peaceable meetings at her house, and on another occasion, in 1670, goods to the value of £16 were forfeited. The Methodist church in the early days was in Back Lane, the old building being now a bungalow. The leaders were A. W. FitzHackler, W. P. Richardson, Robert Dixon, John Cook and George Hallam. The Society, now numbering twenty members, is meeting in a modern building, and has the distinction of including the Southwell circuit steward, Mr. G. Hoggard. Epperstone. This village goes back to pre-Norman days, and was latterly associated with Lord Howe of the Royal Navy. Roman coins have been found here and later, medals, to the number of I,000. Through all its history, of the Norman days when the value of the village was £7, through the seventeenth century when it was £I4, goes the story of England as well as the record of a village. The church has a fourteenth-century steeple, built of local water-stone, whose top part was renewed with Mansfield stone in 1880. The three bells sound out the call to worship. The building is tile-roofed, and stands high above the road, a flight of steps providing access to the churchyard. The Methodist record here is enshrined in the account of William Robinson. True he was born at Woodborough in 1869, but he joined the Epperstone society in 1900, and remained with them until his death in 1919. He followed the traditional occupation of a framework knitter, who in 1911 went to America for six months to introduce the industry there. He was a born cricketer, and coached in his leisure time. His wife was one of a family of ten children who lived in a cottage close to the Methodist chapel. The Robinsons became grocers, till she was widowed at the age of forty-one, and for forty-seven years of her life she was the breadwinner. The early days of Epperstone Methodism reach back before the present schoolroom was built, when the approach to the chapel was by a well-trimmed footpath. The building was heated by a large stove, and the preacher used a box pulpit while the choir occupied the hamper-shaped pews. Mr. Fairbank was the Sunday school teacher, and his influence is far-spread. The weekly class meeting was held by Mrs. Thurman, whose husband was the class leader at Woodborough. One of her daughters married the Rev. J. E. Eagles, the principal of Cliff College. Mr. Adamson was also a fine leader and Sunday school teacher, while his wife was organist and acted as hostess to the preachers for many years. It was Mr. Adamson who proposed to have a schoolroom built, only to be met by strong opposition from Mrs. Clark, who owned a row of cottages close by the chapel. Her antipathy was overruled and the schoolroom was built in 1891. There was an effective Band of Hope and a Bible Class led by Mr. North. Mrs. Smith, who was the little old lady with a bonnet, invariably started up in the prayer-meeting `O happy day’. The Misses Dean have earned great respect, Miss Alice Dean as the postmistress for many years, and attending to chapel matters, and Miss Louie Dean for her work as pianist in the Sunday school. These have all passed to higher service, but have left their mark behind in the life and progress of the chapel. Others, whose names may never be mentioned, have been towers of strength in times of adversity, especially through their prayers. They kept the doors open and revealed God’s spirit in the place. Miss Mabel Robinson, from whom these records came, has been the organist since 1928. The chapel owes its continued existence in later days to the labours of loyal women workers led by Miss Wood. Kirklington. This village lies athwart the main road from Mansfield to Newark. The lordship of this place passed from the family of More to that of Henage, and finally to the custody of General Whetham. It is famous on account of a little man nicknamed Robin Hood, who tried to commit suicide by hanging himself from a tree because of a marital quarrel. He was cut down before he was dead, and this humane act so incensed his wife that she rebuked the folk who did it for their over-officiousness. The fact that Robin Hood lived to make history is recognized by all. The church in the village is dedicated to Saint Swithun, and has a nave and chancel, while in the tower of the building is a list of benefactions from which we learn that the contributors were The King’s Majestie £100, Henry, Lord of Dorchester £20, John More Esq. £20, and the Residentiaries of Southwell £5. Near the place is Hexgrave Park, with its ancient encampment of Norman or Saxon origin. The story is told of a wooden pulpit which a vicar of the early part of the last century was in the habit of taking from its base in the church to use as a screen for wild duck shooting on weekdays. This vandalism was ended by the erection of a stone pulpit in the sacred edifice. Calverton. It was at Calverton that the Rev. William Lee, M.A., was to do a wider service than in his capacity as a curate, in the invention of the stocking frame. He was born about 1563 and died in 1610. The income from the churches he served was less than £20 in each place, while the communities numbered fewer than 150 in any one of them. To him is due the manu­facture of the contrivance which was to revolutionize the stocking-making industry. It was an ungainly machine, for he used wood in its making. He struggled long in the manufacture, and ended with success despite the fact that royal patronage and patent rights were withheld. The apparatus was moved to Rouen in France, but misfortune now dogged the inventor, for the French king was assassinated after he had shown signs of taking a considerable interest in the work. So all hope was lost, and Mr. Lee died of a broken heart and was buried in an unknown grave. The improved method was slowly adopted in this land, but it took over zoo years before a cotton stocking was made, and only fifty years later the stockingers of Calverton were starving while three centuries after, in 1815, the hosiery hands were prosperous indeed. In England alone over 27,000 frames were at work, and in the world 42,000 machines were driven. In 1780 there were two dissenting chapels in the village. In one of them John Roe ministered, and defied the discipline of the Established Church with regard to matrimony. As a result, long terms of imprisonment were endured by the wives concerned, until the authorities connived at their escape. The most absorbing memorial of the place is the old rate book of Calverton, which makes records to January, 1720. It bears the inscription `This book was bought by the Constable of Calverton for the town, and the book cost three shillings and 4 pence’. In it we read of twopence given by Richard Hitchin for the watercourse in Grimsmoor, of how in 1737 John Bently of Oxton and John Hutchinson of Oxton paid 6d. each to the con­stable for Trespass for bringing and turning up their horses to pasture near Jackster pool in this parish. Amid the petty delinquencies of the age there is an entry which tells of the fixing of an apprentice at the farm of Mr. Cooke, and again that John Cooper stands for the next Town’s Apprentice 30th November, 1761. There are records of rent for the Church Close, and of early efforts to catch sparrows, threepence per dozen being paid for old ones and three half-pence for young ones. Ravens were killed at one penny each in 1771. The story of levies and rates for the work of the over­seers of the poor were to be entered in the town’s book, and the vicar was exempt from paying taxes. In 1750 the doctor was given one guinea, and if the patient stayed cured for three years then two guineas were due. Constables were evidently chosen by lot, and the church rate was six shillings in the pound, the object being to make the building fit for the duties that were to be performed in it. Land was bought and sold, and the entries were duly made in the register. Substitutes for the militia tell of conscription in those early days. In 1785 there is the story of John Roe and Mabel Morris. Eleven years before (in 1774) a sect called the Roches was founded, and a new building was duly licensed. John Roe lived to the age of ninety-one years, and his chapel was occupied until 1907 by the Primitive Methodists. Wesleyan Methodists were established in the village in 1790, and their chapel was built in 1815. Of the Methodists Thomas Hunt and Robert Harrison stand out. They formed a partnership to save the chapel in 1880. Mr. Hunt, before his death in 1943 at the age of ninety-four, served as a trustee for half a century, and his daughter Mrs. F. Binch was chapel steward and a generous giver to all good causes. She died in 1953. Robert Harrison was apprenticed as a stockinger at Calverton when thirteen years of age, and seventy-six years later was still working at his trade. He remembered the Chartist Riots. He was a loyal Wesleyan Methodist, and came from Kirklington in 188o to foster the dwindling cause at Calverton. In 1901 he received the National Sunday School Dilpoma for forty years service, and he served at various times in all the offices open to a layman, before his death in 1938 at the age of ninety-four years. His children were renowned in the cricket field, and one represented the county when Nottingham was dismissed by Yorkshire for thirteen runs, in 1901. It is possible that the old treader of the stocking frames made the first cricket bats locally. The village of Calverton had nine professional cricketers at the turn of the twentieth century. The cottage in which the Harrisons lived was in their tenancy for over too years. Amongst other notable names are those of Richard Hallam and his wife, Sarah. He was a class leader, and superintendent of the Sunday school until his death in 1893, while his wife, who died in 1922, was a consistent supporter of every social effort. William Bardill, who was born in 1873, was a great helper with the music of the Wesleyan chapel, and his daughter, Dorothy Hempshall, has played the organ for more than forty years. Lowdham with Gunthorpe and Caythorpe. The village of Lowdham is just two miles from Gunthorpe on the Trent. It is famous for its water mill which has already been described, its archbishop, its long-lived vicar, and its modern experiment for helping wayward boys. The archbishop, who derived his name from the village, was Godfrey de Ludham, who was appointed to the See of York in 1258. Two years later he was engaged in a quarrel with the City of York, which he placed under an interdict. He retired to Southwell, where he ended his days in peace. The long-lived vicar bore the name of Redgmore, and died at the age of 105 years. Of even greater significance—Lowdham was the birthplace of Cornelius Brown, a county historian about the middle of the last century. At Lowdham Grange we have in progress today an experiment whose aim is to turn wayward boys into good citizens. At Caythorpe there was a Primitive Methodist chapel in 1844, and at Gunthorpe a former chapel became a blacksmith’s shop. The Methodists at Lowdham have much to be thankful for in the long and successful service of Mrs. N. J. Nicholson’s father, and his family, who have kept the flag flying through many years. Amongst the distinguished workers was Arthur Carnill, who died in 1951, after having been a Sunday school scholar and teacher for over seventy years, chapel organist for half a century, and secretary to the Southwell circuit Quarterly Meeting for thirty years. These offices were in addition to his fine public service for forty-five years on the parish council, twenty years as Justice of the Peace, and thirty years’ membership of the Southwell Board of Guardians and Rural District Council. Such people are the making of a village cause. On one occasion there had been some unpleasantness in the village chapel choir, and not one choir member was present on the Sunday. The old man who raised the tunes—a Mr. Reddish—was ill, and the preacher could find no one to take his place until a little girl, nine or ten years of age, piped up and raised all the tunes at that service! Edingley with Osmanthorpe and Greases Lane. Edingley forms a pleasant village some three miles from South-well. The church, an ancient structure dedicated to St. Giles, was repaired in 1844, partly by the generosity of Mr. Henry Mackon, the remainder of the cost being found by the parish folk. The Manor House here is a very old building, which was formerly surrounded by a moat and had a drawbridge. The cotton mill of early days was bought in 1837 and was taken down five years later. The school was endowed by John Lamb and Samuel Wright in 1731. Many folk here suffered for their rights, amongst them Mary Handly, who was distrained upon while not at home, the bailiffs leaving goods not worth three shillings. John Wood and Stephen Moore had their property forfeited at the same time by John Horner and John Dallimor, who were churchwardens. The Methodist chapel in this village was erected in 1831. It has loo sittings, and a new porch was added in 1898. Farnsfield. This is a large village about four miles from Southwell, and was the birthplace of Augustus John Gregory, a brave explorer and scientist who died in 1905. Here too was the home of the blind postman, George Yates, who brought the letters and postal packets for many years from Southwell main office. On approaching the village he blew a small horn, and the folk come to their garden gates to be invited by him to sort out their own letters. He is buried in the churchyard, and his epitaph bears witness to a brave man who earned an honest living under great diffi­culties. Amongst the famous villagers was also the clock maker, Stacey, who in 178o made several fine examples of the engraver’s art. Farnsfield as a village suffered much because of the persecution of the Quakers. We read of Nathaniel Price who, for being at a meeting was fined £ 1 by the judges; but because he was only a poor apprentice, the officers took his coat and breeches, four half-pence, together with his knife sheath and scissors! It was a typical case of the senseless cruelty of those days. William Watson was fined on a similar pretext the sum of £5, and had goods taken to the value of £16. Later he was distrained of a great sack of hay by warrant. Sheep worth £33 were taken from Ralph and John Bateman, while from the said William Watson household goods and cattle were taken to the extent of £60. The work of the village was the making of pots and brushes, in the old days, while latterly it has been dignified by the addition of a railway station, a gas works, three places of worship, and two schools. Methodism began in Farnsfield in 178o, when John Astling opened his house in Quakers Lane for the services. He afterwards became a zealous local preacher. The first itinerant to minister here was William Bramwell, in 1798. The society was small, but efforts were made to build a new chapel in the autumn of 1799, and succeeded. The preacher then was Mary Barritt, who afterwards became Mrs. Zechariah Taft. Persecution was rife, but the work flourished under the leadership of Joseph Bowman and William Brown. When the Nottingham Circuit was divided in 1807, and Mansfield became a circuit town, Farnsfield was duly transferred, and continued to prosper. A larger sanctuary was built in 1829, at a cost of £530. Four years later an end gallery was planned, costing a further £70, and in 1836 a day and Sunday school was erected at a cost of £125. Three years afterwards, in 1839, side galleries costing £155 were introduced, and subsequently new day school rooms were added. Visiting preachers have been many during the years, and have included Dr. Hannah and Charles Richard­son the Lincolnshire Thresher. An organ was built in 1858, and four years afterwards a vestry, costing £50, was given by the generosity of one of the members. All these buildings were settled on the model deed. Gas was put in the buildings and a new heating apparatus provided. In 1875 the Mansfield circuit was divided, and Farnsfield put into the Southwell circuit then formed. The establishment of a library, a Tract Society, and a Friendly Society was much to the advantage of the chapel and the community generally. A new chapel was built in 1898, and in it Mr. and Mrs. Charles Rhodes were great workers especially on the musical side. The day school continues now as a junior mixed school. The village has traces of ancient settlements at Camp Hill. A curious feature of the parish church tower is that its north wall with an outside buttress is enclosed in the present building. Blidworth. Though not at present in the Southwell circuit, Blidworth is one of the villages round about, and the story of Methodism in this place is therefore apposite. Methodism began before the first chapel was built in 1787. It was already established when Richard Blatherwick of Blidworth married Ann Lamb, for there are extant class tickets issued in 1757 to Josiah Crane the grandfather of Ann Lamb. The society met in a building, still standing, in Surgery Lane, and presently was strong enough to embark on the erection of the first chapel in the village. The deeds, still preserved at Mansfield, tell of the granting of `the piece of Land adjoining the Town Street, 85 yards, also a building lately erected thereon, and now used as a Meeting House by a number of people called Methodists, to the use of Thomas Spowage, William Heath, John Gregory, Jun., Richard Blatherwick and John Knowles, Jun.’ The present chapel stands on the same site, and after 145 years, the descendants of these good folk met, in 1932. There was a great revival of religion in 1790, news of which the travelling preacher, John Moon, sent in an account to John Wesley. It was said `They were scarce able to contain themselves, and many remarkable conversions took place’. The original chapel stood for fifty years, and in 1837 a larger building was erected on the same ground, at a cost of between £400 and £500. Mr. Blatherwick recollects being taken, not sent, there, and he remembers also the hardness of the seats! In the early days unattached females sat to the preacher’s right, and unattached males to his left, while the centre of the building was reserved for mixed couples. Pew-rents applied to the gallery only, and farmers with their families took advantage of them. It may be said that the family pew had something to do with the success of Methodism. The free seats on the ground floor were occupied by such characters as William Hopkinson, George Pogson, Mr. and Mrs. Hinchliffe, Thomas Kirk the tailor, and Mr. and Mrs. Clark, senior, whose son Samuel was the village cobbler and a student of Greek, while Sarah, the daughter, became Mrs. Baxter whose husband was active in the work of the Church for many years. The evening service was always followed by a prayer-meeting, and those taking part were mighty in prayer. In cottage prayer meetings, classes and love feasts these men and women told of their vivid .experience of salvation. When the lower schoolroom, built in 1837, finished its service as a day and Sunday school, then in 1885 a new building was erected, and it is still used as a day school. Truly those folk realized the importance of education in the development of character and of citizenship. In 1931 the devoted women of the society asked the trustees to consider the building of a new chapel, since they had accumulated over £826 towards the sum that would be needed. In due time plans were prepared, and the large congregation that gathered for the last service in the old place bore witness to the devotion of grandparents and parents alike. Hymns were raised that had been sung there many a time, and when the service ended the members still lingered in the place they loved so well. On 5th October, 1932 the third chapel to be erected on that same site, was opened by Miss Ethel M. Blatherwick, who represented the women whose toil and service had been realized. The building was designed by Mr. F. W. Tempest of Mansfield, and the cost—over £1,960—was gladly raised by those present. In February, 1952 an electric organ was installed for an outlay of £590. The generation of yesterday had come to their Father God and proved that He was their salvation. May the generations that follow know that His song in them, in us, is one.